Sorry about the lack of posts today — my daughter & I spent the day shopping and I just woke up from dozing for two hours. And yes, the kids watched TV the entire time. Something has to give when a girl’s 9 months pregnant. 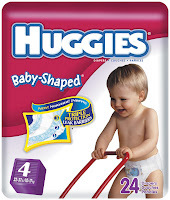 Moms By Heart just posted a fantastic new $2/1 Huggies diapers coupon — and it’s a pdf, so there is no print limit. I suggest you print as many as you’d like now as the last Huggies pdf was pulled off the internet pretty quickly. I printed a bunch off….I just tried to use this at safeway and it didn't scan!!! Safeway doesn't double computer printed coupons either. Hang in there on the pregnancy! and you're not the only mom who takes a nap and lets her kids watch tv while doing so, kudos to you for being honest enough to blog about it! another option would be to save the pdf and then you can print as you use them! Just a thought!